In this dissertation, Henry Ibekwe calls into question the silently-held presumption that the Latinization (i.e. the use of Latin alphabets in transcription) of indigenous languages in southeastern Nigeria is both necessary and sufficient for their orthography. The arguments presented herein aim to demonstrate the fact that Latinization has systematically excluded an entire realm of symbols and meanings which facilitate the inter-subjective transfer of ideas; realms that cannot always be navigated by relying upon transcription by way of Latin alphabets. 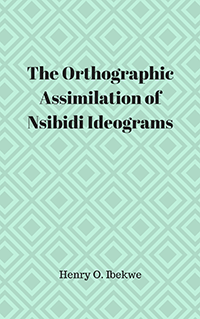 In order to adequately address several of the weaknesses identified in the Latinized scripts, the author argues for an expanded orthography that is more inclusive and representative of the sociofacts, mentifacts and artifacts that are peculiar to southeastern Nigeria.